Potential treatment for age-related memory problems. 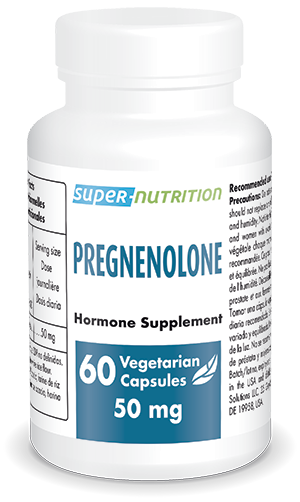 Pregnenolone is a natural hormone with a pivotal function on memory, mood, stress reduction, rheumatoid arthritis and interacts with other natural hormone supplementation. DHEA has often been called "the mother hormone." So, it would be appropriate to say that Pregnenolone is "the mother of DHEA" and the "grandmother" of the other steroid hormones. When you take Pregnenolone, your organism converts a part of it into DHEA, which is then used to make the sexual hormones Testosterone and Estrogen. Another part of Pregnenolone is used to make more Progesterone, Cortisol and Aldosterone. The part which is not metabolized also carries out important specific functions. It is in memory enhancement that Pregnenolone supplementation shows the most interesting results: it is in the brain that the level of Pregnenolone is naturally the highest. Several studies show a significant improvement in learning abilities and memory enhancement, as well as all psychomotor performances, following Pregnenolone supplementation. An animal study (Flood J. F., Morley J. E., Roberts E.: Memory enhancing effects in male mice of Pregnenolone and steroids metabolically derived from it: Proceedings of the National Academy of Science, 1992; 89: 1567 - 1571) realized at the Veterans Medical Center in St. Louis (Missouri) concluded, "Pregnenolone is the most powerful substance ever tested for memory enhancement." Other ingredients: microcrystalline cellulose, magnesium stearate, silicon dioxide. Oral supplementation is generally one 50 mg dosage per day, taken preferably in the morning or at midday. Upon a healthcare professional's advice, persons suffering from rheumatoid arthritis can take higher dosages. The wish list lets you save items you're interested in so you can add them to your cart easily the next time you visit the site.